Winter scene with train crew shoveling snow off tracks of Madison-Portage Railroad. Stereo. 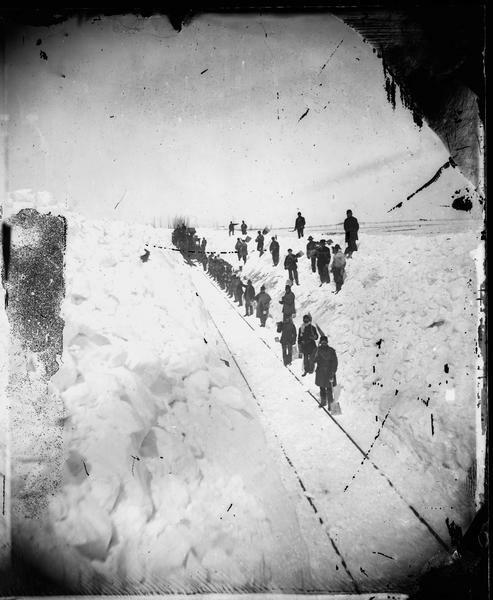 "The Grand and Majestic Snowbanks on the Madison and Portage Railroad, 24th of March, 1875," possibly one of four views of "15 to 30 ft. high snow-banks" in Dahl's 1877 "Catalogue of Stereoscopic Views."